Manuel Ramirez was born in Alhama in 1864. His elder brother, José, taught him how to make guitars and at the age of 27, in 1891, he set up on his own. Manuel became one of the most successful guitar makers of his time, winning medals at various exhibitions for the superb quality of his guitars. In addition to standard classical Spanish guitars, he also produced eleven-string instruments. Segovia was very impressed with Ramirez guitars and played them on many occasions. 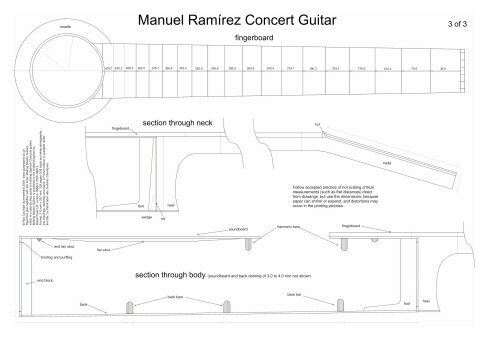 Many influences of Hermann Hauser can be seen in his guitars, and the Ramirez plans provided here should produce a powerful concert-standard guitar.